At Radcliffe's Science Symposium, "Contagion: Exploring Modern Epidemics," Pulitzer Prize-winning journalist Laurie Garrett said there is need for improved local and national disease-management entities. The topics waiting to be discussed read like the writing prompts of a dystopian novelist, yet the mood in the packed Knafel Center last week was upbeat. 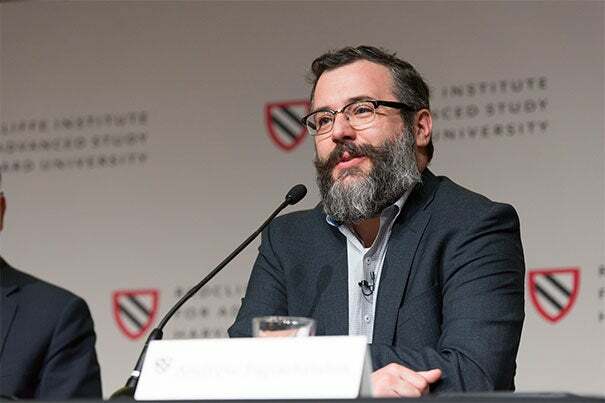 “Contagion: Exploring Modern Epidemics,” the cornerstone of the Radcliffe Institute’s 2017–2018 Science Symposium, featured a diverse group of researchers, journalists, and physicians discussing their work on infectious diseases and virulent social epidemics such as gun violence. The keynote speaker, Laurie Garrett, a Pulitzer Prize-winning journalist who has covered global public health for decades, sketched a history of the major infectious disease outbreaks of the 21st century. In each case, from yellow fever to Zika to HIV, Garrett showed how failures of governance contributed to the severity of the epidemic. Garrett said there is need for improved local and national disease-management entities, but also called for better global organization. She pointed out that the majority of global health infrastructure is dependent on funding from only two sources, the U.S. government and Bill Gates, either of which could choose to withdraw funding, leaving the world vulnerable. “What we’re trying to deal with is supranational problems: They know no borders,” Garrett said, expressing concern that current trends toward nationalism would harm global health policy. She told the audience to anticipate many deadly epidemics thanks to exacerbating factors such as climate change and antibiotic resistance. Other panelists discussed research advances that could help control epidemics. Kevin M. Esvelt, assistant professor at MIT, talked about his lab’s effort to genetically engineer mice to become immune to Lyme disease and so reduce the number of Lyme-carrying ticks, which transmit the disease from deer or mice to people. Another panel explored uses for big data, such as analyzing rich molecular data to better understand disease or gathering population-level data to track and possibly curtail epidemics. The final panel broadened the scope of what could be thought of as an epidemic. Daphne C. Watkins, assistant professor of social work and psychiatry at University of Michigan, spoke about a “gender epidemic” in which adherence to traditional definitions of manhood is damaging the mental health of young black men. Andrew V. Papachristos, associate professor of sociology at Yale University, examined how gun violence spreads through vulnerable populations — particularly young black men, and especially those with gang affiliations — much like a pathogen. “Violence concentrates just like an epidemic within populations,” Papachristos said. A map of the social network of gun violence victims looks like a map of disease transmission. Those who associate most closely with the affected — or infected — are most at risk of becoming victims next. 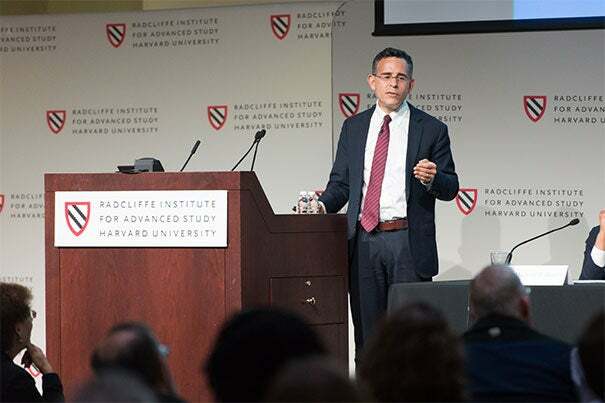 Exposure was also an important concept for Andrew Kolodny, co-director of opioid policy research at the Heller School for Social Policy and Management, Brandeis University, who described perhaps the largest epidemic facing the U.S. today: opioid addiction. The dominant factor in addiction is repeat exposure, Kolodny said. Though people with opioid addictions may turn to black-market drugs like heroin, Kolodny made a strong case that overprescription of painkillers, not recreational drug use, is the source of exposure driving the U.S.’s skyrocketing rate of overdose mortalities. The social epidemic researchers drew on the lessons of infectious disease as well as the language. Kolodny recommended that the U.S. use outbreak-containment techniques to tackle the opioid crisis, starting by eliminating sources of infection — unnecessary prescriptions. The epidemics covered were diverse and daunting. Still the speakers shared an optimistic philosophy: The better we understand these problems, the closer we come to ending them.